that I recieved by my second cousin. My Grandfather, Hugh Robert Penney of Carbonear, Newfoundland and a crew of 173 men were aboard the S.S. Southern Cross. His Son, Norman Robert Penney and many other relatives were also on the ship. My Grandfather was Second in Commmand of the S.S. Southern Cross that was said and his Captain was George Clarke in Command. 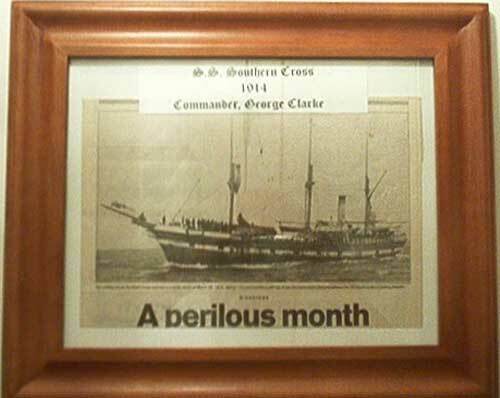 In 1914 with George Clarke in Command of the S.S. Southern Cross and the Ship that was loaded with Seal Pelts and wanted more to have a bumper crop and started to fill the decks with more Seal Pelts and a Storm came up with High winds and Heavy Snow and the ship's decks were filled with seal pelts and the Sea water had no place to go because the holes on deck were blocked with Pelts and the Ship started to sink quickly and went to the bottom in minutes. The Sealers were inexperinced men from Conception Bay, Nfld. The S.S. Southern Cross was sighted by the S.S. Portia, with Captain Thomas J. Connors Commanding and a whistle was blown by the Portia and was answered by the Southern Cross about five miles west- southwest of Cape Pine in the Gulf of St. Lawrence. There were high winds and visability was nearly zero and was never seen or heard of again. The S.S. Kyle that now lies in the mud in Harbour Grace was used, and other Ships were ordered to go to look for the S.S. Southern Cross, but after 20 days at Sea they only found debris of the ships contents and returned to Port. The Southern Cross resulted in the greatest loss of Life in any Newfoundland Sea Disaster. A Sealing Commission was appointed to investigate the Ships disappearence and could only attribute it to an "Act of God". The intensity of the storm, the high bulwarks, the heavy load of pelts and a low mounted engine were all thought by some experience mariners to have contributed to the Disaster. The Mother, Maria Jane King Penney, my Father, Ambrose Penney Sr. was born in Carbonear and 8 other sisblings were sponsered by a family in Portsmouth, NH and came to the United States in 1915.